Gregg Mayles is one of Rare's longest-serving employees and can list some of the firm's most famous titles on his impressive CV. He's currently hard at work on the studio's next offering, Sea of Thieves, but has taken the time to post some interesting info relating to the SNES classic Donkey Kong Country. Donkey Kong's revised design in the game is often credited entirely to Rare, but it would seem that Nintendo's most famous employee left quite a mark on the project. Be sure to keep your eye on Mayles' Twitter account for more behind-the-scenes information - we know we will! The list of things I would do to own that concept book is very long indeed. At first, I thought "Grandpa" Kong had one of those red baboon butts, but I think that's just the tree in the background. Anyways, another good call by Miyamoto. 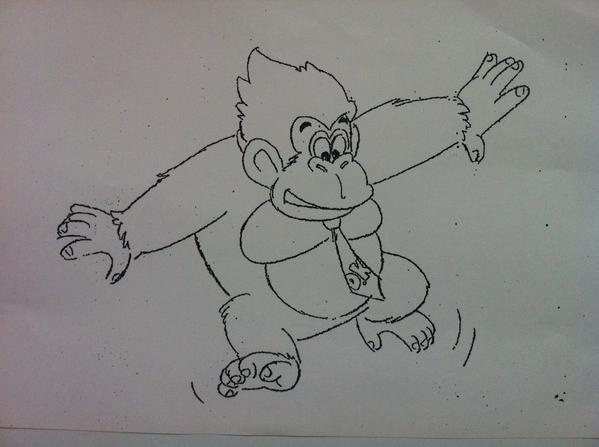 So does this mean DK's tie wasn't inspired by that Billy Mitchell guy after all? Now THAT a would be a prize collector's piece! I know people love Rare, but I have to say both this and Miyamoto's original design beat Rare's version of Donkey Kong by far. I could read these sort of DKC tidbits all day long. Here's hoping he isn't finished yet! Since I was pretty much raised on DKC and SMW when I was a toddler and thus hold those games near and dear to me, it's always great learning new things about my favorite games. Here's hoping he teaches us a few more new things! @Luna_110 Yeah.....that would be awesome! As a cartoonist myself, I can really appreciate those concept sketches. It's funny...I enjoyed many Rare games, but I always felt they really lost their mojo the further away from Nintendo projects they got. This sort of paints a picture of that...Miyamoto had a bigger hand in shaping one of Rare's biggest successes then we originally thought. Does anyone know if Nintendo released any official art books? I've got a few from smaller books from Japanese gaming magazines, and the Hyrule Historia they put out some time ago, but I'd love to see more Nintendo concept art and sketches. Now we need a physical release of DKC artbook. Mr. Miyamoto created the character.... never in my life have I ever considered the fact that someone other than Miyamoto was the one who thought he should wear a tie. @Not_Soos I thought the same thing.